Delmar Blasco was the Secretary General of the Convention on Wetlands (Ramsar, Iran, 1971) from 1995 to 2003. It is widely recognized that under his leadership the Convention was transformed into a much more active, visible and relevant instrument in the international environment and development arena. He paid particular attention to the needs and expectations of developing countries and put strong emphasis on the question of synergies among the multilateral environmental agreements (MEAs). The most visible result of this effort is the Joint Work Plan between Ramsar and CBD. 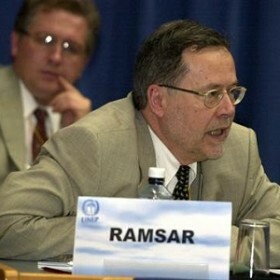 During his tenure as Ramsar SG he also advocated in favour of an active cooperation with national and international NGOs and prompted the Ramsar COP to formally recognize the International Organization Partners of the Convention, which at present are BirdLife International, IUCN, WWF and Wetlands International. Before joining the Ramsar Secretariat, Delmar Blasco worked in positions of leadership in the Geneva-based International Council of Voluntary Agencies (ICVA), in IUCN – The World Conservation Union, and in the Environment Liaison Centre International (ELCI) based in Nairobi, Kenya. Since September 2003, he resides in Catalunya (Spain) and works as a freelance consultant, mainly on issues related to wetlands and MEAs, and also as a translator from English and French into Spanish.